Christine Carlisle and Gail Gummin, are collaborating to increase awareness of two ancient forms of Chinese medicine; foot reflexology and acupressure therapy. Wash. became involved in the connection between feet and health during her career as a professional ballerina in New York and around the country. Gummin, a California native, developed an interest in nutrition and alternative methods of healing while teaching special education. In 2007 Gummin enrolled in Bauman College and received training in Nutrition Consultation and Asian Bodywork, which she began using in conjunction to help treat her patients’ whole bodies. In 2013 Gummin and her husband Mark, who works remotely as a nuclear physicist for NASA and Lockheed Martin, left California and moved to Oregon. “California is where I was born and raised but I don’t relate to it anymore,” Gummin said. Carlisle’s path to Silverton was more meandering. Working as a professional dancer in New York she suffered a series of injuries to her ankles during her early 20s that left her with “bone on bone” friction and unable to perform. She did not end up in India but she did spend time studying the world’s religions and apprenticing with a reflexologist who taught her the concept of relieving pain and tension in the body through corresponding reflex points in the feet. Eventually Carlisle, who most recently lived with her husband in Minnesota, came back to Silverton to care for her aging mother and to spend time in the climate she loves. “I told my husband, ‘I do not want to die in a snowbank. I want to die in a rosebush in Oregon,’” she laughed. After the move Carlisle became a ballet teacher for the American Academy of Performing Arts Company in Silverton and the lead artist for the fountain mosaic in Silverton’s Coolidge McClaine Park. That is where she met Gummin. The two women struck up a conversation and Gummin was moved to volunteer for the venture but in a unique way. “I said, ‘I will donate to this project by giving you free treatments every Monday,’” she said. Carlisle was suffering from lack of sleep as well as physical pain from the 12 hour days she was working. “She literally worked on me until she got my meridians back in balance. The next day after she worked on me I had a sustaining energy for the next four days. She got my body out of deep pain,” Carlisle said. Around this time Gummin received a Silverton Food Coop membership as a gift from her husband and felt inspired to contribute more. A creative donor, she decided to rent a space in Live Local Marketplace, where the Coop currently resides, in order to help bring in business. 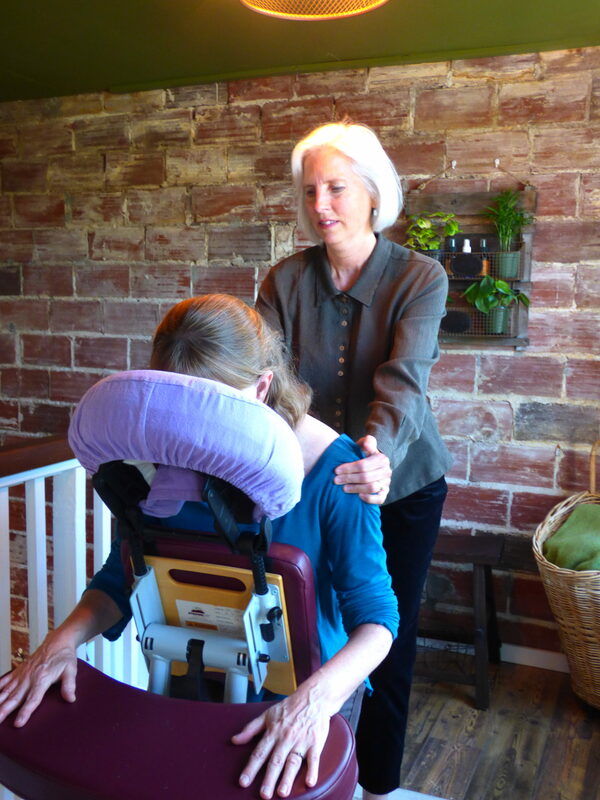 Utilizing a small space overlooking the store and with a panoramic view of the creek, Gummin set up a simple Shiatsu massage chair and a few assorted wellness items for sale. “It’s a zen retreat,” Carlisle said. Although Gummin maintains a larger office above Whimsy Etc., where she does most of her bodywork and nutritional consultations, she uses the smaller space to reach out to busy clients on a consistent basis and for a nominal fee. 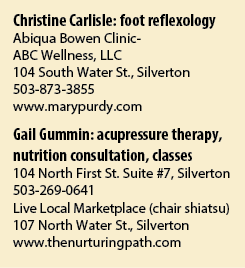 This summer, in order to promote her new venture and to help Carlisle, who was opening a practice of her own in Abiqua Bowen Clinic-ABC Wellness, LLC down the street, the two women teamed up, manning a booth at the Silverton Farmers Market offering chair Shiatsu and reflexology to shoppers. Both women are excited about the future and plan to continue working in partnership on health and wellness classes that will help educate the community about various ways to relieve stress and pain and to combat weight issues. Both women agree that the journey to healing the body can take many different methods and involve many different practitioners, but it can also begin with a single step. “I consider myself a health concierge; my priority is to make sure you are well served,” Gummin said.